The Poulet family were an old West Country family, which by a series of marriages had acquired manors in Somerset, Devon, Wiltshire and Hampshire. Members of the Hampshire branches became Marquises of Winchester and Dukes of Bolton. The senior Somerset branch had their seat at Hinton St George, near Crewkerne. Manorial families were also armigenerous - so check some of the old Heraldry and Peerage books also. Knighted 1523/25; created Baron St. John 9 Mar 1539; Earl of Wiltshire 19 Jan 1550; Marquess of Winchester 11 Oct 1551. William was eldest son of Sir John Paulet of Basing, near Basingstoke in Hampshire. 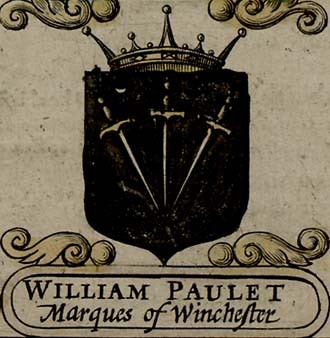 The Paulets of Basing, a cadet branch of the family of Hinton St. George, acquired their Hampshire residence in the early 15th century on the marriage of William Paulet's great-grandfather to Constance, a coheir of Thomas Poynings, the last Lord St. John of Basing (d. 1428). Paulet’s father held a command against the Cornish rebels in 1497 and died after 1519. His monument remains in Basing Church. He married his cousin Alice, daughter of Sir William Paulet, the first holder of Hinton St. George. William, their eldest son, was born, according to Doyle, in 1485; Brooke, followed by Dugdale, says 1483; while Camden asserts that he was ninety-seven at his death, which would place his birth in 1474 or 1475. The latter actually fits best with other family relationships. Early in 1536 Paulet was granted the keepership of Pamber forest as heir (he was not, in fact, even the senior coheir) to Hugh, Lord St. John; later in the same year he was ranked among the Councillors of noble blood in an answer to the northern rebels' charge that the Council was made up of new men; and in 1539 he was himself created Baron St. John. Paulet became steward of the bishopric of Winchester, probably during the episcopacy of Richard Fox (d. 1528), although he first appears in office during the breif tenure of the see 'in commendam' by Wolsey. His kinsman by marriage Thomas Arundell was a member of Wolsey´s household and as steward of the bishopric Paulet was responsible for the Membership in 1529 for Taunton of the Cardinal's secretary Cromwell; on the eve of the parliament Cromwell instructed his agent Ralph Sadler to 'require' Paulet to name him 'one of the burgesses of one of my lord's towns of his bishopric of Winchester', but whether Paulet did so on instructions from Wolsey or out of friendship for Cromwell is not known. Administrator of the will of William Windsor. Paulet had been appointed joint master of the King wards with Thomas Englefield in 1526, but the claims of Englefield´s judgeship meant that Paulet was soon the sole effective master. 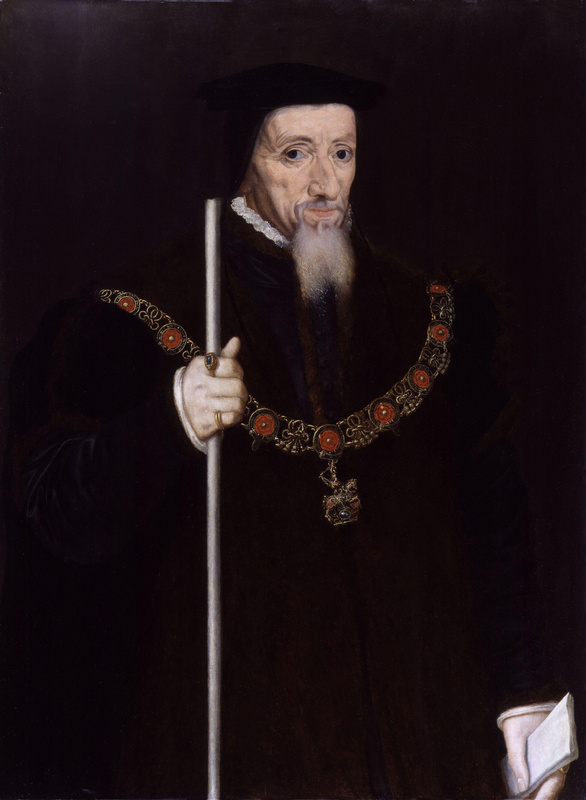 Created ‘Surveyor of the King’s Widows and Governor of All Idiots and Naturals in the King’s Hands’ in 1531, he became Comptroller of the Royal Household in May 1532 and, a few months later, Joint-Master of the Royal Woods with Thomas Cromwell. This concentration of wardship offices was formalized in 1540 by the erection of the court of wards, later of wards and liveries, with Paulet as master. In May 1532 he succeeded the courtier Sir Henry Guildford as comptroller of the Household, and later that year or early in 1533 he and his 'fellow and friend' Cromwell assumed joint control of the King's woods. In Oct 1532 he was with the King at Calais and in the following spring he accompanied Thomas Howard, 3rd Duke of Norfolk´s embassy to France took over to join King Francois I in a proposed interview with the Pope, and kept Cromwell informed of its pro­gress. But Clement’s fulmination against the divorce pronounced by Cranmer caused their recall. In the winter he went with the Duke of Suffolk and others to reduce the household of Catalina de Aragon and in 1534 he joined with the Earl of Wiltshire to persuade Princess Mary to renounce her title. As Comptroller, he appears on a list drawn up by Cromwell on the dorse of a letter of Dec 1534 and thought to be of Members connected, perhaps as a committee, with the treasons bill then on its passage through Parliament. His name is also to be found on the dorse of a private Act passed during the last session of the Parliament concerning the heirs of Lord Willoughby de Broke, together with those of seven of his family and kinsmen, including his son John and John's wife Elizabeth Willoughby. It was probably his second son Thomas, rather than his younger brother of that name, who was included in a fragmentary list of boroughs and nominees seemingly prepared by Cromwell for the parliament of 1536. He was one of the judges of Fisher and More in the Summer of 1535 and of Anne Boleyn’s supposed accomplices in May 1536. When the Pilgrimage of Grace broke out in the Autumn, Paulet took joint-charge of the musters of the Royal Forces and himself raised two hundred men. As the rebels complained of the exclusion of noblemen from the King’s Council, Henry reminded them of the presence of Paulet and others. In carrying out his Royal Master’s commands, he was not, it would ap­pear, unnecessarily harsh. Anne Boleyn excepted him from her complaints against the council: “the controller was a very gentleman”, she admitted. His services did not go unrewarded. The King visited his ‘poor house’ at Basing in Oct 1535. The site and other possessions of Netley Abbey, near Southampton, were granted to him in Aug 1536. He acted as Treasurer of the Household from Oct 1537 to Mar 1539, when the old St. John peerage was recreated in his favour, but without the designation ‘of Basing’. The new peer became the first master of Henry VIII’s Court of Wards and Liveries in 1540, Knight of the Garter in Apr 1543 and, two years later, Governor of Portsmouth. Appointed Lord Chamberlain of the Household in May 1543, he was Great Master (ie. Lord Steward) of the same from 1545 to 1550. The only one of Paulet´s children known to have sat in the Commons was his son Chidiock, although several of his near relatives did so, among them his cousin Hugh Paulet and his nephews Sir Henry Capell and John Zouche, who was first returned for Hindon, another of the Bishop of Winchester's boroughs. Nicholas Hare probably owed his return for Downton in 1529 and Taunton in 1547 to his friendship with Paulet, while John Bekinsau, although doubtless acceptable to Gardiner as a Member for Downton and Hindon in Mary's reign, was Paulet´s neighbor in Hampshire. Michael Gore was returned as his servant to the Parliament of 1545 for Portsmouth, where Edmund Cockerell, one of his subordinates in the Exchequer, and John De Vic, his secretary, were also returned after Chidiock Paulet had become captain of Portsmouth, as was his friend Sir Richard Sackville while Chidiock was captain-designate. As master of the wards and (probable) custodian of Henry Weston, Paulet may have been responsible for the re-enfranchisement of Petersfield in 1547 when his younger brother George was sheriff of Hampshire. In 1540 Paulet had again been sent to Calais and four years later he served on the French campaign, being appointed with Sir John Gage to see to the transport of the army overseas. In Jul the Duke of Suffolk described him as 'one of my hands' at Boulogne and in the following year the Duke endorsed the King's choice of Paulet to take over the military government of Portsmouth. A year before the King’s death, he became Lord President of the Council and was nominated in Henry’s will as one of the eighteen executors who were to act as a council of regency during his son’s minority. In 1550 Paulet gave his support to the Earl of Warwick against the Duke of Somerset- whom, according to one account, he bluffed into financing the coup against himself. Though Wiltshire was not, like Northampton and Herbert, prominently identified with Warwick, he received a further advance in the peerage on the final fall of Somerset. Created Earl of Wiltshire and given Somerset´s office of lord treasurer in exchange for the great mastership of the Household he was advanced to the marquessate of Winchester when Warwick was created Duke of Northumberland in Oct 1551. Six weeks later, he acted as Lord Steward at Somerset’s trial. On 7 Jan 1550 he adjourned the House in the absence of Chancellor Rich and he presumably did the same after the death of Gardiner during the parliament of 1555, which he later dissolved. Careful as Winchester was to trim his sails to the prevailing wind, the Protestants did not trust him. Knox, unless he exaggerates, boldly denounced him in his last sermon before Edward VI as the ‘crafty fox Shebna unto good King Ezekias sometime Comptroller and then Treasurer’. Northumberland and Winchester, Knox tells us, ruled all the court, the former by stout courage and proudness of stomach, the latter by counsel and wit. Though the reformers considered him a Papist, Winchester did not scruple to take out a license for himself, his wife and twelve friends to eat flesh in Lent and on fast days. Knox did him an injustice when he accused him of having been a prime party to Northumberland’s attempt to change the order of the succession. He was, on the contrary, strongly opposed to it; and even after he had bent, like others, before the imperious will of the Duke and signed the letters patent of 21 Jun 1553, he did not cease to urge, in the council, the superior claim of the original Act of Succession. After the death of the young King and the proclamation of Queen Jane, Winchester delivered the Crown Jewels to the latter on 12 Jul. According to the Venetian, Badoaro, he made her very indignant by informing her of Northumberland’s intention to have her husband Guildford crowned as well. William Paulet, the Lord High Treasurer, brought the crown to Jane to 'see how it fitted'. To his surprise, Jane refused, saying that she had not asked to see the jewels. Paulet told her, 'you must take it boldly, and soon I will have another made to crown your husband with'. But Winchester and several other lords were only waiting until they could safely turn against the Duke. The day, 15 Jul, after the latter left London to capture Princess Mary, they made a vain attempt to get away from the Tower, where they were watched by the garrison Northumberland had placed there. Winchester made an excuse to go to his house but was sent for and brought back at midnight. On the 19, however, after the arrival of news of Northumberland’s ill-success, the lords contrived to get away to Baynard’s Castle and, after a brief deliberation, proclaimed Mary as Queen. She confirmed Winchester in all his offices, to which in Mar 1556 that of Lord Privy Seal was added, and thoroughly appreciated his care and vigilance in the management of her exchequer. His wife, Elizabeth, attended Queen Mary at her coronation on 1 Oct 1553. He gave a general support to Gardiner in the House of Lords and did not refuse to convey Elizabeth to the Tower. It was the Earl of Sussex, however, and not he, who generously took the risk of giving her time to make a last appeal to her sister. So firmly was Winchester convinced of the impolicy of her Spanish marriage that, even after it was approved, he was heard to swear that he would set upon Felipe when he landed. But he was rapidly brought to acquiesce in its accomplishment and en­tertained Felipe and Mary at Basing on the day after their wedding. Upon Mary’s death, Winchester rode through London with the proclamation of her successor and, in spite of his advanced age, obtained confirmation in the onerous office of Treasurer and acted as Speaker of the House of Lords in the parliaments of 1559 and 1566, showing no signs of diminished vigour. He voted in the small minority against any alteration of the church services, but did not carry his opposition further; and Heath, Archbishop of York, and Thirlby, Bishop of Ely, were deprived of their offices at his house in Austin Friars. 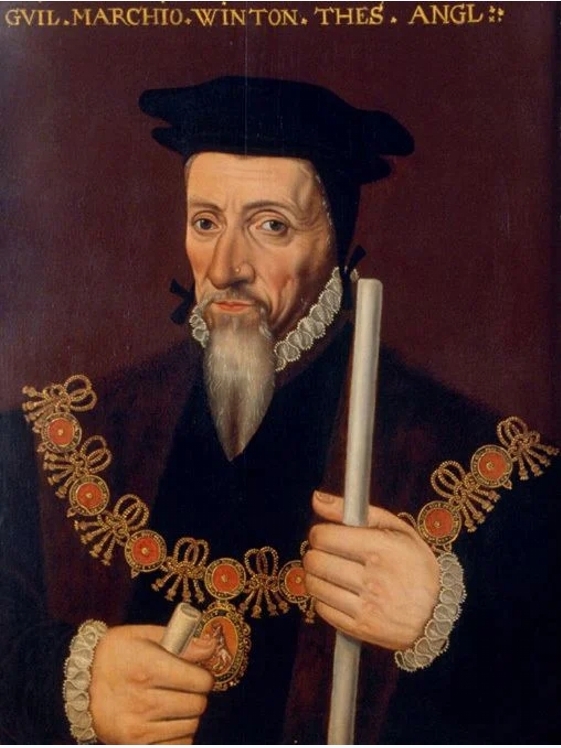 For some years, he was on excellent terms with William Cecil, to whom he wrote, after an English reverse before Leith in May 1560, that ‘worldly things would sometimes fall out contrary, but if quietly taken could be quietly amended’. Three months later, when the Queen visited him at Basing, he sent the secretary warning against certain ‘back counsels’ about the Queen. Elizabeth was so pleased with the good cheer he made her that she playfully lamented his great age, “for, by my troth, if my lord treasurer were but a young man, I could find it in my heart to have him for a husband before any man in England”, she said. Two years later, when she was believed to be dying, Winchester persuaded the council to agree to submit the rival claims to the succession to the Crown Lawyers and Judges, and to stand by their decision. He was opposed to all extremes. In 1561, when there was danger of a Spanish alliance to cover a union between the Queen and Robert Dudley, he supported the counterproposal of alliance with the French Calvinists but, seven years later, he deprecated any such championship of Protestantism abroad, as might lead to a breach with Spain, and recommended that the Duke of Alba should be allowed to procure clothes and food for his soldiers in England, ‘that he might be ready for her grace when he might do her any service’. He disliked the turn Cecil was endeavouring to give to English policy and he was in sympathy with, if he was not a party to, the intrigues of 1569 against the secretary. Winchester was still in harness when he died, a very old man, at Basing House on 10 Mar 1572. His tomb remains on the south side of the chancel of Basing Church. Winchester lived to see 103 of his own descendants. His wife was Elizabeth, daughter of Sir William Capel, Lord Mayor of London in 1503, by whom he had four sons and four daughters. Many accounts incorrectly state that he married as second wife Winifred, daughter of Sir John Brydges, Alderman of London, and widow of Sir Richard Sackville, Chancellor of the Exchequer, but she was the third wife of his son, John, the second marquiss. Winchester rebuilt Basing House, which he had obtained license to fortify in 1531, on so princely a scale that, according to Camden, his posterity were forced to pull down a part of it. An engraving of the mansion after the famous siege is given by Baigent in his ‘History of Basingstoke’. The Marquis was one of those who sent out the expedition of Chancellor and Willoughby to Northern Seas in 1553 and became a member of the Muscovy Company incorpo­rated under Queen Mary. A portrait, by a painter unknown, is engraved in Doyle’s ‘Official Baronage’ and another, which represents him with the treasurer’s white staff, in Walpole’s edition of Naunton, from a painting also, it would seem, unassigned, in King’s College, Cambridge. Two portraits are mentioned in the catalogue of the Tudor exhibition, in both of which he grasps the white staff. If the latter, which is in the Duke of Northumberland’s collection, is correctly described, its ascription to Holbein must be erroneous, as Winchester did not become Treasurer until 1550 and the artist died in 1543. He took Bacon´s place as Speaker on 4 Mar 1539 and from 5 to 25 Oct 1566, when 'the decay of his memory and hearing, griefs accompanying hoary hairs and old age' led to his retirement in favour of Sir Robert Catlyn. Sir Robert Naunton, in his reminis­cences of Elizabethan statesmen (he was nine years old at Winchester’s death) reports that, in his old age, he was quite frank with his intimates on the secret of the success with which he had weathered the revolutions of four reigns. Questioned how he had stood up for thirty years together amidst the changes and ruins of so many Chancellors and great personages: “Why ortus sum e salice non ex quercu”, quoth the Marquis. And truly it seems the old man had taught them all, especially William, Earl of Pembroke.